It really doesn’t matter what your smartphone, desktop icons, or traditional flip-over calendar shows you—Today IS January 1st! (And yes, I realize this article is dated and posted on December 30th—but I still affirm that Today is January 1st.) And do you know why?? It’s because, as humans, we have a tendency to hold off, to delay, or to procrastinate. We want to wait until the calendar says it is the beginning of something before we actually begin something (a psychological trigger for so many of us–myself included). It’s a fascinating (but anti-productive) tendency that perhaps comes in part from wanting structure, clarity, order, and a clear starting point. 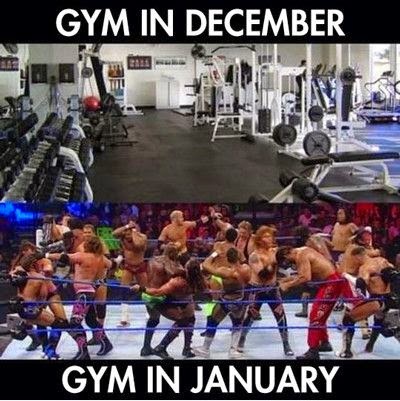 It’s why gym parking lots are full the first couple weeks of January, but then relatively normal all the rest of the weeks of the year (including, and especially, the last two weeks of the year. “I am going to get started on these fitness goals just after the holidays when the New Year starts…” are some of the most famous, overused, and unintentional words). One of my favorite types of images about resolutions and goals. Not only do we wait for a completely arbitrary start date, but we assume that for our effort to be worth continuing, they must produce perfect results. [We’ll have more posts and podcasts on this concept later.] So, to continue the fitness analogy, if you miss the third workout you had scheduled (for whatever reason), the resolve to continue or to believe in future results often starts to weaken. That’s why we must consider every day to be January 1st. Perhaps you want to develop a new talent or ability (play the guitar, take up pottery). Perhaps your have 10 (or 25, or maybe even more) pounds that need to part company with you. Perhaps you have a great idea or outline for a book in your head. Perhaps there is a relationship you would like to create or improve. Perhaps you have some plans to explore or build your own business opportunity. Perhaps you want to become more patient, more understanding, more grateful. Perhaps you want to continue your own education in some way. It may sound cliche, but the “tomorrows” we are continually committing to generally never happen. If you plan to start tomorrow—sneak up on your goal a day early and surprise it. If you are going to make it happen next week—blow it out of the water (up to seven days early!) and start now. Anyone can start—and if you’re looking for a powerful (and fun) read on the subject, you have to check out Jon Acuff’s book START. He does a masterful job walking the reader through five phases (Learning, Editing, Mastering, Harvesting, and Guiding) that all begin with a simple, solid start. “The solution to [our] problems is to share principles that are true of everyone and applications that are flexible. As we continue to march down the road to awesome, that’s what we’re going to do. The five stages, for instance, are true for everyone. The road to awesome always travels through them. “However, the method you use to travel from one destination to the next will be determined by your own experience—what you’re made of, what you desire, and what you’ve done to this point” (START, p. 94). Decide on something to do today—no matter how small or simple—and set aside 15, 10, or even 5 minutes to get started with the very next action you can take to move forward. It’s time to take action. What is it you want to start today? Write it down in a way and in a place that it will invite consistent action. If you want some accountability, we invite you to share one key start goal in the comments below (I’m going to put one down there as well—debating between a fitness objective or a commitment to more regularly creating content her on LearnDoBecome—and I hope you’ll hold me to it). We can do this. You can do this. So when the mattress wants to absorb you or hold you prisoner, break free because Today is January 1st. When the voices of procrastination, doubt, or fear creep in, let them know Today is January 1st. And if others around you don’t believe in your abilities to achieve, the only way to set the facts straight is to get to work and create the reality that you desire. And what better day to start than January 1st? Okay, it’s commitment time. And I decided that my START today will be to more regularly create content (podcasts, articles, templates, etc.) here on LearnDoBecome. (I may also need to add a fitness component soon, too–I’ll keep you posted.) Feel free to hold me accountable and please let me know if there is a topic or specific area you would like that content to focus on. And please share below what your START today is going to be. Spend 15 min each day in quiet time w/ Jesus. Complete the fitness challenge for the day w/ my online fitness coach/group. start back eating better (been lax since Thanksgiving), exercise, be a better Christian, read, pray more, keep my table cleaned off!! get organized..cluttered house and mind. looking forward to your podcast… early for me in the morning!! gotta get to bed. Goodnight! Eric…..My Garage is a catch all. And so is my sunroom that is where my desk is (and happens to be my favorite room ) When those two areas of my life would be organized and stay that way I could focus more on keeping the rest of the home in order. My problem is wen I pull away from regular routine things to “work” on those projects, I fall behind on them. i hope the Webinar today will have a light bulb moment for me. I am a busy multitasking mom and preschool teacher/MDO Director and love what I do for my family and school and want to continue doing both and not have to quit working in order to have more “TIME” to be organized. Help! I can identify. When my desk and dining room table are stacked with my papers, bills, articles, etc, I can’t focus unless I organize what’s in the piles. This is where I will start. Exercise more, commit to more time in scripture and prayer, deepen my relationships with others…. and oh, yeah…. have fun while I’m doing all of that stuff! BTW thanks for your recent podcast with Jon Acuff. I bought the “finish” book and am already halfway done with it. Great resource for us perfectionists! BASED meals that are delicious, nurturing, and that my teen son would actually eat. I want to have more energy and to help my son stay healthy. There are many other goals I have for this year, but this one has risen to the top. My husband is in medical school and things have been pretty rough. I recently bought a book (Yell Less, Love More by Sheila McCraith) that has inspired me and given me the tools I need to start being a more patient mother of very young children =) My goal is to go 100 days without yelling at my kids (not necessarily 100 consecutive days although I’m going to shoot for that!). Ironically, I am still reading the book and was going to start this goal tomorrow (January 1st =), but after reading this AMAZING post, I’m going to start today! And, luckily, I have NOT yelled at my kids today so I figure today is the perfect day to start. Only 99 left to go! Me to good to know there are other people that yell at there kids too. Thanks. Wish I had that book 40 years ago….! one of my goals is to ‘eat sitting down.’ And yes I was planning to officially start tomorrow but I love love this idea and will be reminded of this mid month or when I get discouraged when goals don’t go as planned and just remind myself to just start over- it’s Jan 1st! I would like to put 10 new listings in my Etsy shop each month this year (after taking last year completely off). It is doable, and I will start TODAY! Thank you for this excellent article. My goal is to read the scriptures every morning. I know how important they are and how much they bless my life when I read them but I have been a bit lax lately. GREAT post!! And just what I needed to read. Waking up a little earlier and reading scripture or journaling. I will keep my materials on my nightstand. When the alarm goes off I will pull the door shut, turn on my lamp and read and/or journal until I am uninterrupted or for a half hour. I love the motivation of today, being January 1st because often I find that goals I thought to be doable don’t work as expected when 5 very little ones unknowingly twart or thier needs need to change my routine. Then I put of restructuring until some “appropriate” time… No more! I am slowing it down some to open up time for goal setting and organizing , I’m hoping I connect with your plan today. Thank you for this opportunity . I want to immediately file, act, or recycle papers and magazines or mail daily to keep paper under control. Today is my January 1st to prepare for all scheduled activities. It’s a commitmental that I have struggled with but I KNOW once I Master it, I will reach my health and financial goals simultaneously. Great Post! Very inspiring! I just received text message invite to the webinar “4 Unbelievably Simple Steps to Everday Productivity.” I’m taking it tonight at 8:30 EST. This is such a blessing, Thank you!! I feel hope for first time since my husband passed away from a 96 day battle with cancer, he was a rock for our family, I homeschooled our four kiddos, he worked not only his main job, but he also served our community as a 30 yr volunteer fireman! He was actually going to be Chief, but turned it down in December of 2011. His reasoning was, he could continue to be Major over the three stations he took care of, but if he took the Chief position, he would have to sacrifice more time away from us, even though he involved our four kiddos as much as he could! His father was on the fire Dept as well, so was his great grandfather, he actually funded the local firehouse being built by putting he and his wife’s home up for collateral!! So he’s a third generation Firefighter.. We miss him dearly, he was my best friend. I have been so stuck, the first six months were horrid without him, then we started being thankful and getting our focus back on the Lord and His plan for our family. We knew and know that God did not bring us this far to just see us waste away. The kids have been wonderful! We were always so thankful for each of them and that they were truly a blessing, and we didn’t pretend to know “why” they were so awesome!! We just knew we were blessed and knew to be thankful! But, my own issue, has been , time management, four kids; one “me”= disaster! Or so I thought! But today is going to be my Jan 1. I need to get busy living, and stop wasting and without realizing it, the precious time I’ve been gifted to have thus far! I have so many things I want to do, ideas floating in my head, then there’s the neccesitys and sadly my health has suffered from the trauma, but I believe God can and will and WANTS to restore that back to me even better than it was before! Today! Right now! No more waiting! Life, living, Gods purpose for myself and family, won’t find me.. He said “Seek and you shall find, Knock and the door will be opened..etc” well today, I’m knocking, asking, seeking.. And in faith and trust that because God is good, He will finish the good works He began in our family, individually and as a whole! No more waiting, I see a door? I’m knocking! I will seek it out, if I fail? Then I learn! Otherwise, the only alternative I see? Is “Get busy living or get busy dying” , death? Is always a part of life, but quitting is not, procrastinating is fear for me, fear of failure. He gives just enough light to see the next step.. I’m stepping upwards! Thanks so very much for reaching out to me and making this available for free! I pray God blesses you a hundred fold!! Thank you!! I am new here. I just read your story and I just wanted to say I am truly sorry for your loss. I am so happy I am with the program to Learn, Do, & Become. I plan to follow it faithfully so that I can regain the positivity I once enjoyed in life. Take care hun, and thanks for your true-life story. God Bless. I just joined the Mastery Program today. I have no idea what this means, but it’s time for me to make major changes and I’ve tried doing it on my own for a lifetime. Now I am going to ask for help and figure out how to architect the life I want. This being all online, I’m not sure how this is different from doing it on my own, but this is where the learning comes in. We’re so excited to have you with us! The Facebook group will be a huge boost, and now you have the tools to get your whole system up and running. Welcome, Jane! I’m thrilled that today can be January 1st! What a great idea! No waiting. No planning. On ‘I’m not quite ready yet’. Just start. Something. Now I’ll go back through this article for advice on narrowing down what I should start on. There’s so much to do that I haven’t decided what I need to do first and when I do decide I have trouble deciding how thoroughly to do that job before starting another crucial job. It all seems crucial. You’ve inspired me to try to figure out where to start again though. That’s saying a lot. Thank you! Love your energy, Suzy! We’re so excited for you! It does all seem crucial at the same time. Think of it as dominoes…just pick the biggest, most influential one first. Good luck!! Inspired to check out a new area in this beautiful city I live in…weekly? Monthly? Excited to begin! Looking forward to tomorrow, I was so prepared today! five minutes to start time and I was logging in…wait it’s tomorrow! Can’t wait to get started. I have been unpacking boxes from storage, and there is so much to get a handle on. We had a house fire and the clean-up crew packed everything…I would have gotten rid of, now I am doing one box at a time. I would really be so happy if I could get my house & basement organized so I could enjoy it for some years before I die. I always seem to give up. Too overwhelming. Been this way for 20 yrs. I’m 61, & not getting younger. I stumbled onto this and it seems to be a blessing, my life is cluttere in a box and I can’t organize my life to save my self. TODAY I will START getting my house in order, I am an out of work Teacher, so all my teacher stuff, and class library are all over my little apartment. I will start today to get it organized and take back my living space!!! Thank you for telling me today is January 1st! It’s a great day to begin! Grateful for this opportunity. I am looking forward to getting more organized, thus helping me move forward with life and productivity. Thank you for the encouraging words! I live in a retirement community and I love getting projects done for my neighbors. Most of my projects used to simmer slowly at the back of the stove, (figuratively) 1f not sit in the fridge or freezer for weeks on end. Of my eight January projects to complete, I’ll tackle my book mark design project first for our Little Free Library. I want our neighbors and tourist visitors passing by to know more about our vibrant community through links primed on our book marks. Today I will walk to my UPS store with my therapy dog, Mousse to find out how much printing will cost for 1,000 book marks, double sided, and what is needed to have front and back sheets photo ready for publishing. I want to clean off the kitchen “messy counter ” where my paperwork jams up. It makes my kitchen looks junky and I am stressed out when I look at it. . The table in the kitchen is also a magnet for paper. What do you do with the paper? Everyone says to handle it once, but the amount and type of paper is overwhelming and some needs my husband’s attention, also. Also, it tells me info I need. Help! I am so thankful to have found Learn Do Become. This program is a God send for me. My life is so cluttered. It has gotten to a state of depression for me. I tried everyday to get anything going, but I would normally wake up tired and that effort would eventually fail. I suffer with Arthritis and have a hard time sleeping some nights. I would always just do something that I wanted to do, which was never anything constructive. If I did, I would have a lot of body pain by the time I was ready to sleep. So now, things have piled-up, backed-up, grown-up, and gotten bigger than me. But with this program, I will chip away at all of it. Thank you so much LDB, for making it possible to get a hold on my life again. I love the idea of everyday being, JAN. 1. Until now, I didn’t realize how much emphasis I would put on that “one” day. I reserve so much energy to start anew, with so many little things I wanted to do. So if I make everyday a JAN. 1, I am sure I will feel that energy each day. (Thank you) Now I haven’t read through the entire program yet, but I am going ahead to state that the first thing I would like to do is spend time with my God by reading bible scripture every morning. He is first in my life and the Word is important to feed my spirit. So that will be my JAN. 1 daily start. (One Year Bible) I am hoping to get to know some of you all by names and chatting back and forth. I also want to wish everyone a very Happy New Year 2017. Let’s do this together. God Bless! After reading your email I am so excited to get started but am aware that even though I have many goals I must take Baby Steps to get them all into a routine. My primary goal is to get into a routine to declutter my home. My second goal is to work at my Real Estate business more consistently to create a career I can be proud of and successful in. I am looking forward to the webinar tomorrow. My comment is that I had a real light-bulb moment from a person above (Laurie, March 17, 2016) who said something that really spoke to me. She said that to her, procrastination is fear of failure. Well, may I just say that I have always jokingly said I’m the queen of procrastination, that my whole family is. But to see someone write that it is connected to fear, and she also relates this to death……..well, it hit home. I’ve always been very fearful of death, until recently when I had a spiritual experience that changed my thinking, and that has lessened a lot of my fears. But the thing about procrastination being related to fear of failure………it’s like getting the key or answer to why I procrastinate. Wow! Thanks Laurie, whoever you are. I appreciate your words. They are so helpful to me. This is all a God thing. I enjoyed everyones comments ..I am excited for tomorrows class. I need help in many areas as we are newly retired..and have become very lazy..we love our recliners..way to much..and I have a lot of clutter..I struggle to get more organized in my sewing room as I have started a new business so I have people coming into my home and I don’t want to be embarrassed..I also need help with my weight and losing about 50 pounds..and getting motivated with doing some exercise..and also like a lot of you other people I have started reading the scriptures and asking for help in these areas of my life..and believe with Gods help everything is possible..
LOL! My Christmas tree is still up! How many think that is crazy? Well, I am taking a different approach this year. The tree brings me joy so at least I have one room where I can find peace. As for the rest of the house… I know, one step at a time. I cannot eat the elephant in one bite. I need to read up on how to open an Etsy store. My mother passed away a couple years ago. It is a long story but let us just say, I wasn’t ready. Hence, I kept more than what I should have because I wasn’t ready. My Mother was a Collector and an Antique dealer. I have been waiting to be ready to let go. I believe I am now ready to part with some of the beautiful things and allow them to bless other people’s homes. I have to admit, even the idea of some is overwhelming because of sheer volume. Truly, I have a great deal to sell and/or give away. (you can never out give God, you know.) 2017 is my year of finally with letting go of my old life. All 365 days in the year of 2017 will each be January 1st for me. It has to be or I will faint before the race is finished. I am very excited to be a part of such an inviting, honest, sharing community! Thank you! I cannot wait to get started. Finally, the architect of my life, a new life. I want to do it correctly or the best I can do. Many blessings to all for an abundant, organized life. Shine! I am soooo excited to have listened to the class, signed up for Mastery, and now, to have read this Jan 1 post! I have this glimpse of my life changing! Been a “do it myself” girl most of my life. I have things I’ve wanted to “GET TO”, had great plans for, and many many have never even gotten started. I deeply want to be more effective. I want to live my purpose, (I actually have sometimes!) But when it comes right down to the day to day, I’m always hunting for things, running late for things, usually NOT QUITE prepared, planning & planning to get the 100 or more boxes in my storage room gone through, hoping I’ll get that stamp on that card and actually send it..lol…and am now having dreams of not knowing where I am, hunting and hunting and missing all the people and all the events that were going on as I hunt for my way there. DO YA THINK IT’S TIME FOR A CHANGE? Yes, it definitely is!!! I’ve set up the little desk in my little living space, put ‘in order’ the THINGS around me as much as possible! Now for the calendars, piles of papers, strewn, half done ideas written and misplaced, WOW, getting this all over you! Unloading!!! Why? Cause I’m letting go of it all. I AM NOW the change I want to see!!! And most definitely grateful for Perry’s !! The voices of clarity and simplicity and consistency and HOPE !! I know I can’t do it alone! 66 and using God now ! As well as these 2 messengers of LIGHT that He has sent out to help us all on our way. Can’t wait for Monday’s group call !!! I’ll be taking daily action “of whatever sort I can” on My January 1st’s!! Started today!!!! I feel it ! Am Seeing it!! THANK YOU BOTH FOR BEING HERE AS OUR GUIDE! My books ARE getting written. I AM a strong and organized leader in my new ‘at home’ business, leading 236 so far… (wasn’t feeling good enough, and wasn’t keeping track of things, and was letting tooooo much (& too many people) fall through the cracks!!!) I’m already feeling and seeing a difference in my productivity and self belief & my business activity!!.. just because of the hope! and knowing I have specific directions, continued support & mentoring & sharing & reporting !!!! IT’S A NEW DAY!! JANUARY 1ST ALL YEAR ! THANK YOU ! THANK YOU ! APRIL & ERIC !!!!!!!!! I am so excited this endeavor has come my way. I want to have less clutter and chaos in my life. God always provides a way, and as such I believe has led me to this podcast. I look forward to each Jan 1 and know that as I grow in the process my life will be more productive, and the ‘light’ will only shine more brightly. I am looking forward to a tidy house, more time at projects, starting and writing that book that I have been going to for some time now and finally getting all those pictures up on the wall that I have not gotten up yet. Thank you for your article, I always hold on things too much . We leave in apartment and we just move to our new house thinking, Pile will move away, after few weeks, things started piling again. & Thank you for sharing. This is hilarious! Other people want to clear off their desks/tables, eat sitting down, sort their piles of papers… I’m not alone! There is hope! I like the idea of January 1st. I have a ton of things for January 1st but today… Today at 9 pm I will be thankful for who I am and stop dissing myself for what I ate/or didn’t eat today, what I said/didn’t say. Looking forward to Life’s Reclaiming Webinar tomorrow am. Thank you! And to everyone else, let’s deal with this all… one tortoise step at a time! My goals are to read the Bible every morning, not just 3 or 4 dats/wk; keep the table cleared, declutter and organize my office space, same with closets and library. AND get my blog started. I want to spend at least an hour every day cleaning something in my home to keep it organized. And I want to spend 30 minutes a day on Bible study. *Grow in my relationship with God-all inclusive-prayer, worship, knowledge, obedience…. -Build a stronger, closer relationship with my husband and children. -Spend more time with my parents. -Set aside more time for family and friends. -Declutter my house and brain. -Meet each student where they are and encourage them to grow spiritually and mentally. -Build up my Mary Kay business. -Make decisions and take action. -Be fearless and quit putting limits on God. Matthew 6:33-But seek first the kingdom of God and his righteousness, and all these things will be added to you. It’s been a long time since I’ve written down my goals and said, “Today is the day.” I’m so tired of living a life of feeling overwhelmed and conquered. I’m tired of saying, “It’s always darkest just before the dawn,” and then waiting to see just how dark it can get. My world is pretty dark right now. But even though it’s 10:30 at night on July 30, it’s actually the dawn of Jan. 1st, and today is the day that I start changing my world. Awesome post Eric! I plan to read my word daily and journal more, 1st 15/20 mins of the day. I plan to organize better and procrastinate less. I also intend to focus on getting rid of clothing by selling and giving away. I also plan to spend time weekly writing my story about being a caregiver. Also, I work best by doing 15/20 min increments. HAPPY JANUARY 1 ST! I have 2 months from today to read 2 brochures about a delegation trip I am going on later this year. I will read 15 minutes each day till I finish them. I commit to “me” time for reading and journaling each morning. 20 minutes. I jump up and get rolling in the morning, planning to return to it before I go to work. If I don’t do it first it doesn’t happen. My whole day is different if I set myself up in the morning. I dream of having a strategy to get an area complete. I am constantly in a shuffle, almost getting it right with too much stuff left over. I need a transition zone where sorting can happen in finish-able chunks. I struggle with pulling out more than I have time to complete. I need a time block schedule for home maintenance and not do more than that. I feel like I clean and sort endlessly. I must believe that I am capable of releasing this habit. You are in the right place! STEP helps you work in manageable chunks of time, to see your projects come to completion and not just sit in limbo! We would love to share more information on our STEP program if you would be interested! Today on September 28th is my January 1st! I just bought the STEP Mastery program yesterday – today i will start following it! Great article!!! We are so glad to have you with us! Enjoy your journey!!! Noel, We are so glad to have you here, and that you have found some meaningful ways to apply these principles to your life. Have a great week! Learn to speed read. I am going to put a book on laundry to speed read in my Amazon cat right now. Done.